Clearly, you can see one of coke’s (multifarious) effects on your body in real time with these gadgets strapped to your wrist. But what is the practical value of that information, if any? I ask X if this method of dosing feels more reliable than what most everyone else has had to do throughout the history of inebriation — go with their gut instinct. “Yes, it is,” he says, though he’ll rely on his own best judgment as well, particularly in a party setting. 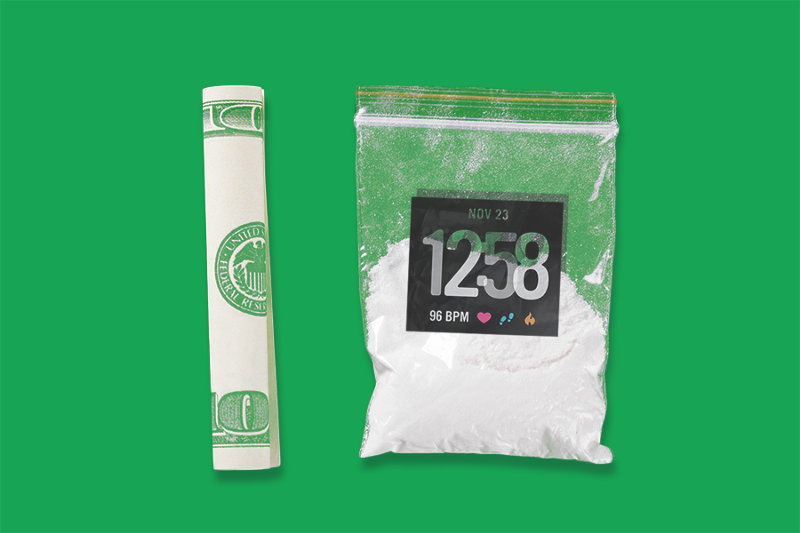 Speaking of which: The fitness tracker binge, like cocaine itself, is a rather social phenomenon. “The first time I did it,” X explains, was “with people who have done it for a long time, so then after I just learned from them.” Later, he got his friends with wearables to monitor their heart rates as well, and they share their bpm often, whether hanging out together or not. “Some of us have higher tolerances, so we use it to keep [tabs on] each other,” he says. But it seems that X has figured out a system he likes, and he knows what to look for — at least as far as a decent high is concerned. If the coke is of a better quality, “rocky and scaley,” then he’ll notice a jump in bpm “almost instantly” after taking some, with a pulse fall-off 45 to 60 minutes later. “If it’s stepped on,” he says — which is to say cut with other ingredients — he gets the same instant bump, but a much quicker fall-off in heart rate, somewhere in the 10 to 15 minute range. And while he never wants to soar above 140 bpm, “around 120 is perfect for me,” he says. Apart from this niche functionality, he only uses the heart rate monitor “occasionally” while sleeping. X isn’t too bothered about Apple having this data, either. “Well, yeah, sometimes it does feel weird,” he admits. “But at the same time, I do work out, so my heart rate is constantly at that point.” Besides, as the excitement of this year’s World Cup and other intense situations have proved, the causes of bpm surges during physical “inactivity” are varied and strange. Even as drug users like X seek the equilibrium to their inebriation with the aid of heart rate monitoring, others are taking cues from the tech to pop their legally prescribed drugs. After all, the point of a fitness tracker is to help you manage your health. Fitbits and Apple Watches may not make drug use safer, but these devices will improve, offering broader, deeper and more accurate analysis of what’s going on with our bodies, and owners will interpret that new information however they like. Miles Klee is a staff writer at MEL.